Abstract: To examine the diagnosis and condition of a patient suffering from neck pain and radiation of pain into arms following a motor vehicle accident. Diagnostic studies include the chiropractic orthopedic and neurological examination, digital x-rays, range of motion and cervical MRI. Introduction: On 10/10/2016, a 38-year-old male presented to our office for injuries he had sustained in an MVA on 10/01/2016. The patient stated that he was stopped at an intersection when the pickup behind him hit him at a fast speed, pushing him through the intersection. The patient stated that he had neck pain and stiffness the radiated into the trapezius area. He also complained about “tingling” into both hands. He also complained of lower back pain that he felt more than the neck. His review of systems was benign, other than the current symptoms of neck and back pain and tingling. The patients Social/Family Medical History included his mother having high blood pressure and Diabetes. The patient is 6’0”. The patient weighs 211 pounds. The sitting blood pressure measured was 122/74. An evaluation and management exam was performed. The exam consisted of a visual inspection of the spinal ranges of motion, digital palpation, manual testing of muscles, deep tendon reflexes and orthopedic and neurological findings. The Cervical exam showed the following decreased motion on visual exam in flexion, extension, left rotation, right rotation, right lateral flexion and left lateral flexion. All of the above motions produced pain. When digital palpation was performed in the cervical and thoracic spinal areas, there was moderate spasm noted bilaterally in paraspinal areas with moderate tenderness noted. In performing the cervical orthopedic and neurological testing, positive findings were present bilaterally with Foraminal Compression and Foraminal Decompression. Soto Hall test was positive when performed in the thoracic spine area. Manual, subjectively rated muscle testing was performed on certain muscles of the upper extremities. Based on the AMA Guides to the Evaluation of Permanent Impairment, 4th Ed., 1993/5th ed. 2001, differences were noted using the rating scale of five to zero. Five is full Range of Motion/Maximum Strength, Four is Full Range of motion with Moderate Resistance, Three is Full Range of Motion/Perceptible Weakness. The Deltoids and Triceps tested normally bilaterally at 5. The Biceps, forearm muscles and the intrinsic hand muscles all tested as a four on the right and a three on the left. Grip Strength tests the strength of the hands which indicate nerve integrity from the cervical spine. In evaluation, the normal would be for a difference of strength in the preferred hand of 10% more. More than that would be a weakness in the opposite hand, less than that would be a weakness in the preferred hand. The preferred hand for this patient is the right hand. The testing below shows a definite decrease in strength in the left hand. Deep Tendon Reflexes were performed on the patient and were noted at a plus two bilaterally. Using a Whartenburg pinwheel, dermatomes showed normal findings except for C8, which was hyposensitive on the left. A Lumbar orthopedic and neurological exam was then performed. Upon visual examination, there was decreased motion in flexion, extension. right and left lateral flexion with pain present on all of the motions. Lasegue’s Straight Leg Raising test was performed and was negative with 80 degree movement. Braggards test was performed and was negative bilaterally. Kemps was done with the patient on both sides and was noted as negative. Ely test was noted as negative. Digital palpation was performed and there was severe tenderness and spasm bilaterally in the lumbar paraspinal muscles. Manual, subjectively rated muscle testing was performed on certain muscles of the lower extremities. Based on the AMA Guides to the Evaluation of Permanent Impairment, 4th Ed., 1993/5th ed. 2001, differences were noted using the rating scale of five to zero. Five is full Range of Motion/Maximum Strength, Four is Full Range of motion with Moderate Resistance, Three is Full Range of Motion/Perceptible Weakness. Muscle testing was done bilaterally in the Quadriceps, Hamstrings, Calf Muscles and Extensor Hallicus Longus and showed Full ROM and Strength. Deep Tendon Reflexes were performed. They negative in the Achilles bilaterally, but +3 in the Patella bilaterally. AP/Lat/Lateral Flexion/Oblique Lumbar’s. The x-rays were read and the Lumbar spine showed the discs were of a normal height and Georges line was un-interrupted. There the Lumbar curve appeared to be hypolordotic. On visual inspection, there was a decrease in the lateral bending bilaterally. The Cervical spine showed that there was anterior spurring present in the C5/6 region of the cervical spine. In the lateral view, the normal curvature of the spine was no longer lordotic, but noted as a “Military Neck.” There was decreased range of motion noted in the flexion as well as the extension views. Also, noted on flexion and extension was paradoxical motion present at C1. Disc spaces were normal throughout the spine, except for narrowing of the disc space at C5/6, as well as spurring noted in the anterior part of the vertebral body. Due to the injuries, orthopedic and neurological and x-ray findings, a cervical MRI was ordered. I recommended that the patient receive palliative therapy until a Cervical MRI could be obtained. The MRI was obtained and personally reviewed. The Cervical MRI performed on 10/14/2016 revealed that C1/2 was unremarkable. There was a mild disc bulge at C2/3 and a moderate disc bulge which abuts the ventral cord and results in mild spinal canal stenosis at C3/4. There is also bilateral uncovertebral hypertrophy with moderate bilateral neural foraminal narrowing noted at C3/4. At C4/5, There is a mild disc bulge which abuts the ventral cord. There is a mild spinal canal stenosis. There is a bilateral uncovertebral hypertrophy with moderate bilateral neural foraminal narrowing. 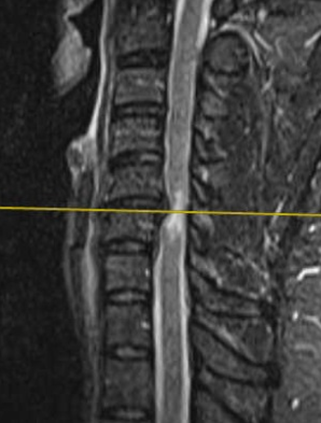 At C5/6, There is a moderate disc bulge which indents the ventral cord and results in severe spinal canal stenosis. There is a resultant T2 weighted hyperintense (high) signal abnormality in the spinal cord at this level. This may represent edema or myelomalacia. C6/7 shows that there is a mild disc bulge which abuts the ventral cord and results in mild spinal canal stenosis. 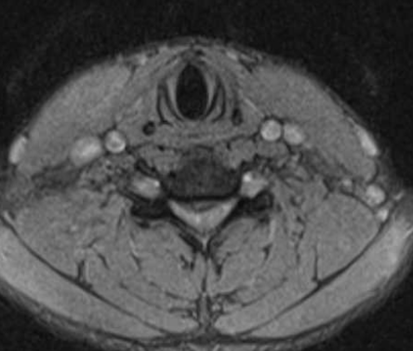 There is bilateral uncovertebral hypertrophy with moderate bilateral neural foraminal narrowing. C7/T1 presents as unremarkable. IMPRESSION: At C5/6, there is a moderate disc bulge which indents the ventral cord and results in severe spine canal stenosis. There is resultant abnormal signal in the spinal cord at C5/6, which may represent myelomalacia or edema. An alert was placed on this study. (B) Axial T2 MRI of the Cervical Spine. The patient was notified of the MRI findings. The patient was informed that care would be discontinued until a consultation was done with a neurosurgeon. The patient stated that he was going to do that. He continued to try to get care, but we refused. The patient was instructed to go to the emergency room. The patient became angry stating that he wanted his records, that he was going to go to another chiropractor for them to “crack his neck”. The patient went to another chiropractor and based on our records, also refused to see the patient. The patient finally decided to go to the surgeon where disc surgery was performed to decompress the spinal cord. The patient contacted our office and thanked us for being so adamant about his treatment. There is much discussion in the MRI report concerning “bulges” and one must first have a handle on what is a bulge and herniation. 1. A disc in which the contour of the outer annulus extends, or appears to extend, in the horizontal (axial) plane beyond the edges of the disc space, usually greater than 25% (90°) of the circumference of the disc and usually less than 3 mm beyond the edges of the vertebral body apophysis. 2. (Nonstandard) A disc in which the outer margin extends over a broad base beyond the edges of the disc space. 3. (Nonstandard) Mild, diffuse, smooth displacement of disc. 4. (Nonstandard) Any disc displacement at the discal level. Studin and Owens discuss this “nomenclature” in their article “Bulging Discs and Trauma: Causality and a Risk Factor”. Disc degeneration, herniations (all variations) and bulging all describe what has happened to the disc itself. Once you have established a definitive diagnosis, then the question becomes, how is the disc affecting surrounding neurological components? Myelomalacia is the effect of that disc when the cord is affected by pressure. If there is bleeding into the cord, then the cord begins a degenerative spiral that can happen rather quickly. As you have read above, it can take what may simply appear as a minor issue to the patient that can lead to major neurological compromise and in extreme cases may lead to paralysis or death. Therefore, it is important carefully analyze the clinical indicators and image accordingly. It is a very common occurrence for the presence of disc bulging and herniations in chiropractic practices. It is of utmost importance for the chiropractor to not only order MRI when clinically indicated, it is important to be able to interpret those images as well. Once the clinical indicators begin to show a different story than presented by the patient symptomatically, it is the responsibility of the chiropractor to make the appropriate diagnosis, prognosis and treatment plan. In this case, that is an immediate neurosurgical referral. Although not a common finding in a chiropractic office, one must still be alert to the possibility of Myelomalacia. Managing the patient based upon an accurate diagnosis is your ultimate goal, and sometimes adjusting the patient isn’t the best first option as diagnosis and prognosis supersede treatment. Fardon, D. F., Williams, A. L., Dohring, E. J., Murtagh, F. R., Gabriel Rothman, S. L., & Sze, G. K.
Zhou, Yihua; Kim, Sang D.; Vo, Katie; Riew, K. Daniel (2015) Prevalence of cervical myelomalacia in adult patients requiring a cervical magnetic resonance imagingSpine (Phila Pa 1976). 2015 Feb 15;40(4):E248-252.